The Crevole Madonna and the Madonna of Buonconvento are unanimously considered the earliest works attributable to Duccio. The basic approach of the two paintings is of evident Byzantine tradition: the elegant stylization of the hands, the typical downward curving nose, the red maph�rion under Mary’s veil, the dark drapery animated by shining gilded lines. 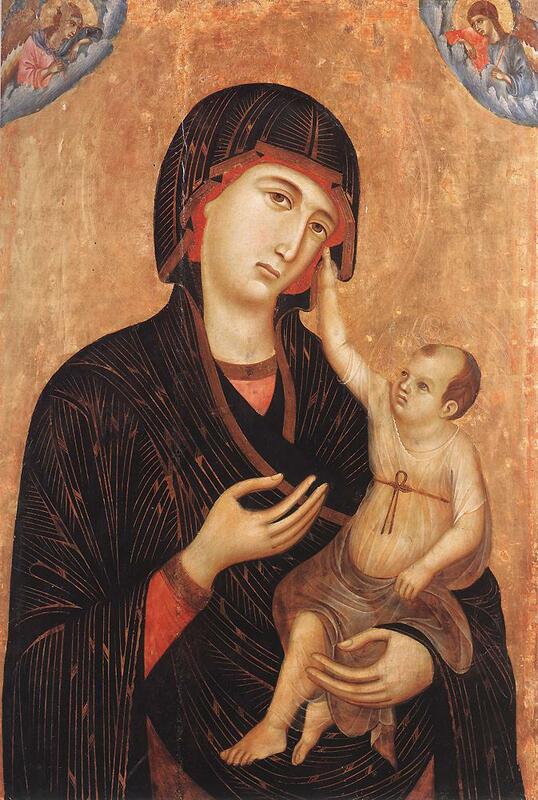 New details appear, to a lesser extent in the Buonconvento Madonna and repeated with greater confidence in the Crevole painting, such as the subtle play of light on the Virgin’s face, over her chin and cheeks, and a clear attempt at plasticism in the folds of the garment around the face. The more carefully considered compositon of the Crevole Madonna shows a faint but decided French influence: the elegant forms of the angels in the upper corners, the veiled transparency of the Child’s garment, held up by a curious knotted cord, and most of all, the intimate gesture of the Infant Jesus, held in a tender embrace.